If you suffer from anxiety, depression, addictions, and other problematic disorders, you can treat and overcome them with cognitive behavioral therapy. Cognitive behavioral therapy, or CBT, is a psychotherapeutic approach that addresses dysfunctional emotions, maladaptive behaviors, and cognitive processes and contents through a number of goal-oriented, explicit systematic procedures. Cognitive behavioral therapy addresses negative patterns and distortions in the way we look at the world and ourselves. It involves two main components. The first component is cognitive therapy, which examines how negative thoughts, or cognitions, contribute to anxiety, depression, addictions, and other problematic disorders, and the second component is behavior therapy which examines how you behave and react in situations that trigger these disorders or conditions. 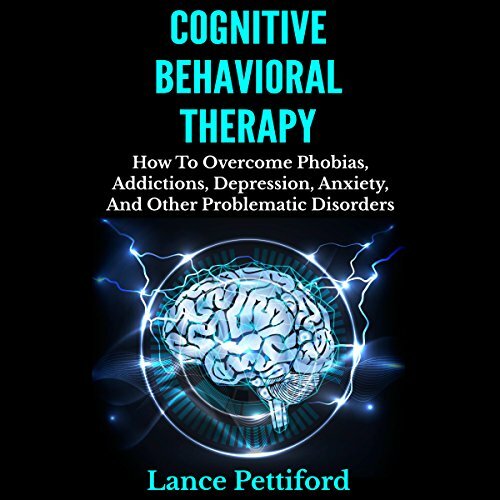 In his book entitled Cognitive Behavioral Therapy, author Lance Pettiford shows you how to effectively use cognitive behavioral therapy to treat any problematic disorder you may suffer from. Exactly what cognitive behavioral therapy is, how it was developed, and what the general process involves. The specific techniques that cognitive behavioral therapy uses to treat problematic disorders, including: cognitive processing therapy, exposure therapy, acceptance and commitment therapy (ACT), cognitive therapy, relaxation training, and dialectical behavior therapy. The cognitive distortions that are involved in the negative thought processes and how to identify them. How to conduct your own mental health assessment so that you can better understand exactly what is wrong and what needs to be fixed. imagine telling a fat person to simply eat less? Sure, it's what needs to be done. But in no way will it help them achieve their goal. Very quick overview of (CBT). It's more of an explanation of (CBT). Not good if you're looking for a self help book. It's only an hour long, but within the hour the narrator covers all the basics about each problem, symptoms, the causes, exercises for how to deal with each problem. Overall, I liked it, but it was just surprisingly short. What would have made Cognitive Behavioral Therapy (CBT) better? Appropriate (or any, for that matter) of research done to support material. The book makes several false claims and it is obvious the author has done zero research on CBT or appropriate therapeutic treatment. What character would you cut from Cognitive Behavioral Therapy (CBT)? I would remove the inaccurate information that could lead to serious health complications or death. The author should not be giving medical advice about detoxing if they are not a doctor or not informed on the topic. The book makes several recommendations that readers try very serious therapeutic procedures on their own, which carries a huge risk. The book recommends people try exposure therapy on their own, and also suggests that alcoholics should attempt to go "cold turkey", which can result in serious medical problems, and/or death. The book is extremely inappropriate, inaccurate, and is in now way a replacement for adequate therapeutic or medical treatment (which the book repeatedly suggests it is: "This book can save you a lot of money and you won't have to go to an expensive therapist"). I would not recommend this book to anyone. First: the young reader mispronounces basic words "EX cetera," and ofTen" being two frequent, egregious errors. Also, this content is not suited to audiobook format at all, as one is frequently asked to write things down. That is seldom feasible when listening to audio books on drives, walks, workouts, ET cetera. Having gone through cbt with a therapist this book is horrible. The Girls voice is horrible and not conducive to therapy it’s a wast of money! !